Spanish fashion brand Mango has launched Rêve de Méditerranée, a new fragrance for its plus-size range, Violeta by Mango. Rêve de Méditerranée is meant to 'evoke a sunrise on the Mediterranean'; notes include bergamot, lychee, green fig, jasmine, cyclamen, rose, cedar and musk. Violeta by Mango Rêve de Méditerranée is available in Spain, in 100 ml Eau de Toilette. I think the fashion industry has to come up with something for the anorectic people – there are a lot of them in the fashion world. I can’t imagine what it would be called…maybe 00? I do not know how it is being marketed in the countries where they’ve introduced it, but I assume not as a fragrance for larger people! 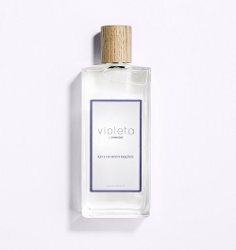 If the Violeta line is in separate stores, makes sense they’d want it to have its own fragrance. But I don’t know much about Violeta. The bigger surprise to me is how classy it looks and sounds in comparison to, say, Mango Lady Rebel Dance Queen. Having lived in Spain, I actually know the answer to this! Violeta is a separate line from Mango with its own stores and the clothing is targeted towards plus-sized ladies. Thank you! Then totally makes sense that they want a fragrance for it.